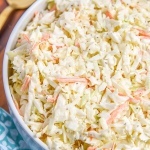 A simple coleslaw recipe for your summer parties! Don't want to make the coleslaw? You can just use the dressing too for the best coleslaw dressing recipe on your favorite salad or slaw mix. Place the coleslaw mix (shredded cabbage and carrots) into a large bowl. Pour the remaining ingredients into the bowl. Mix ingredients well and cover. Keep in fridge overnight before serving, as so the flavor develops. *If you like it a little more watery add in 1/2 cup buttermilk or regular milk. If you like your coleslaw really creamy/soft you can just do 1 bag of coleslaw mix.